This post was originally shared over at 733 last week. as I am posting it here just in case you missed it. 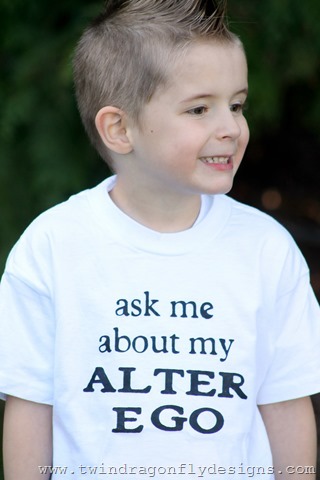 Have you seen those flip shirts that say “ask me about my zombie costume” or “ask me about my pet trex” then when flipped inside out they have a zombie or trex image on the inside? Google “flip shirt” and you will find them. 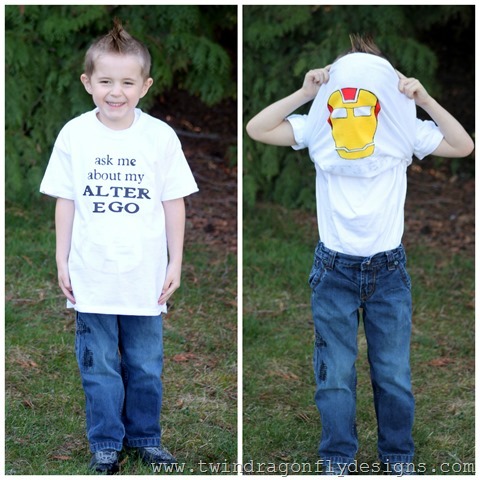 I thought this was a super cute concept and took it a step further to create these Superhero Flip T-shirts for my superhero loving boys. This is Cameron as his favorite hero, Ironman. 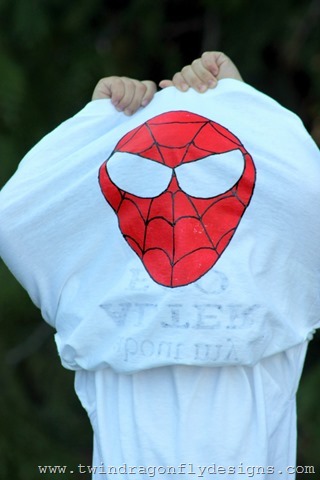 And here is Isaiah and his favorite hero, Spiderman. 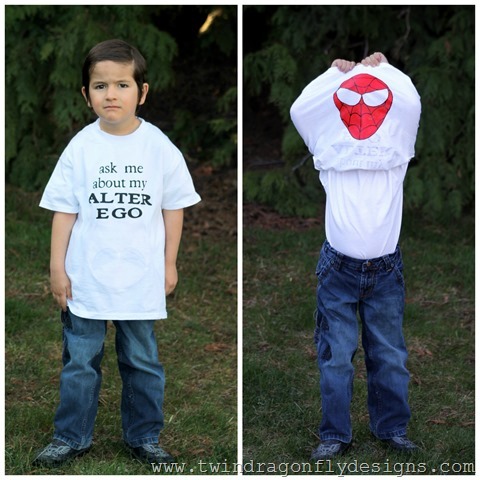 The sky is the limit when it comes to which superhero your child would like to be. 1. 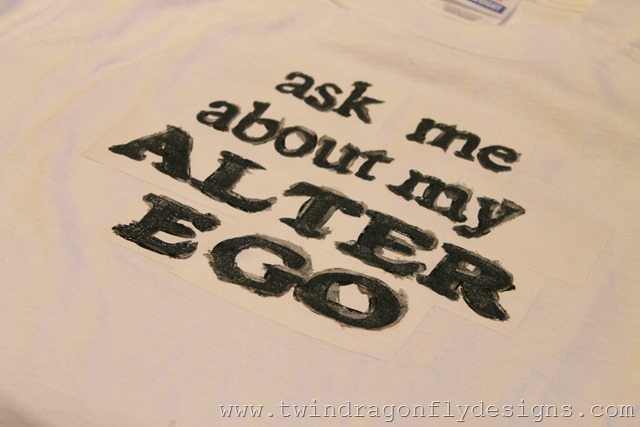 Cut the words “ask me about my alter ego” out of freezer paper. 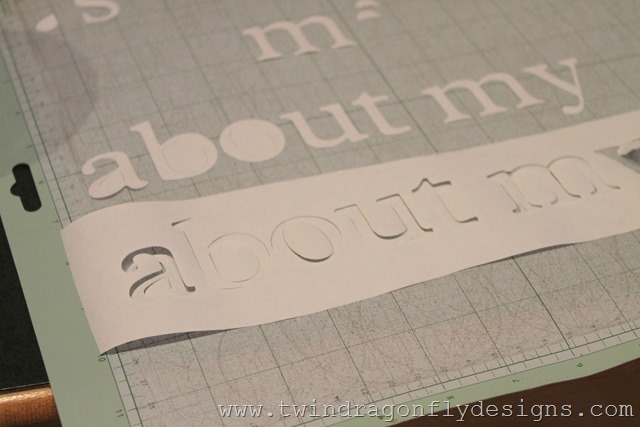 I used my cricut cutting machine but you can totally do this by hand too, it would just take a bit longer. 2. 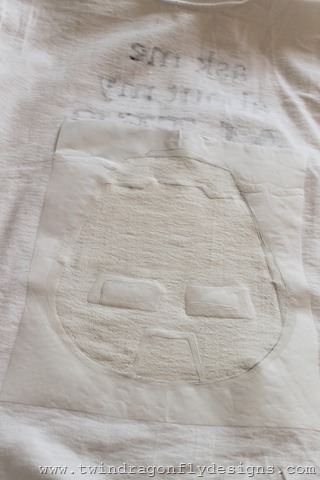 Iron the freezer paper stencil to the front of the shirt. Be sure to press all of the edges down carefully. 3. 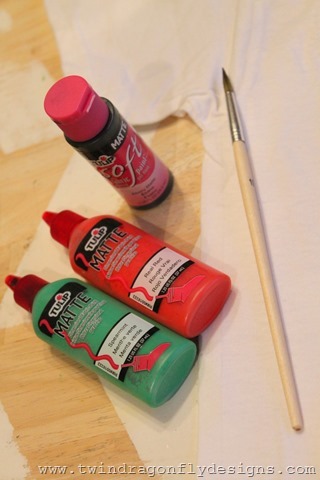 Place a scrap piece of paper inside the shirt, underneath where you are painting so that the fabric paint doesn’t seep through to the back of the shirt. 4. Using fabric paint, color in the stencilled letters. Allow this to dry completely. 5. Turn the t-shirt inside out. 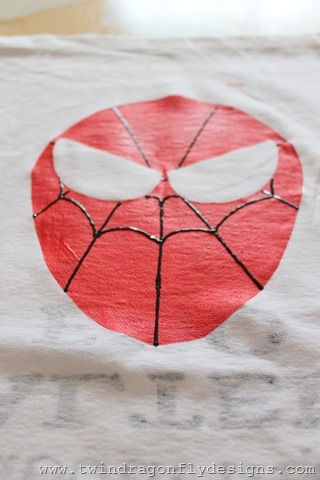 Iron on a superhero freezer paper stencil. 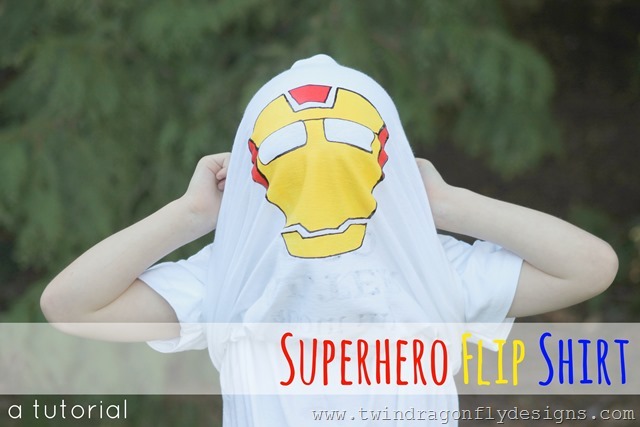 Be sure to have the top of the head point towards the hem of the t-shirt so that when the shirt is flipped the superhero face is right side up. 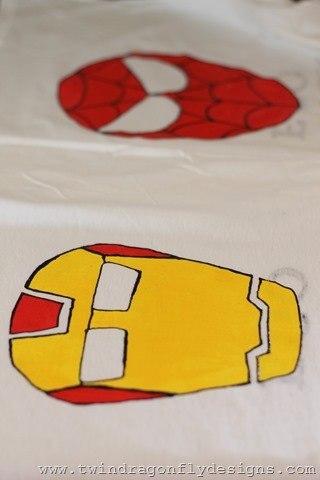 I traced Ironman and Spiderman faces onto freezer paper and used them as a stencil. You can find templates for these characters here. 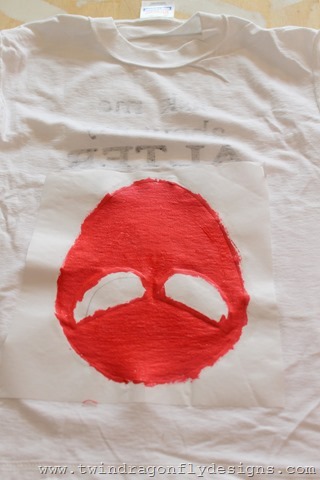 Because the t-shirts that I was working with were white, I painted my superhero stencil with white fabric paint first so that the actual colors of our superheros wouldn’t show through to the front of the shirt. 6. 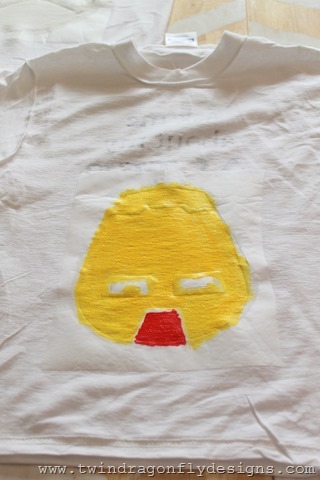 Paint the character using fabric paints. 7. Add details using dimensional fabric paint if desired. 8. 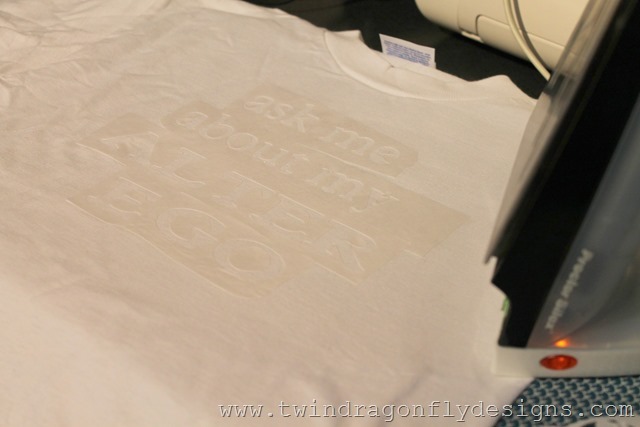 Peel off the freezer paper stencil and allow to dry completely. Iron the back of the painted area to heat set it. 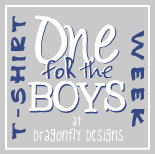 Stay tuned for more boy t-shirt goodness! 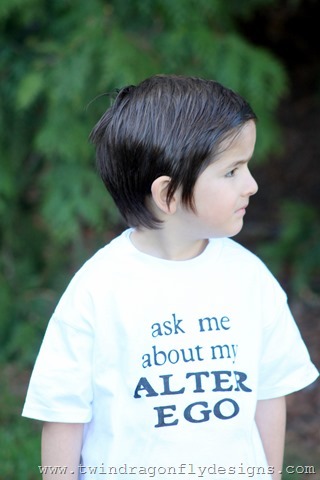 OMG, this is just plain adorable! Although, I might never see my son’s face again ; ) Pinning this! I am completely in LOVE with this. 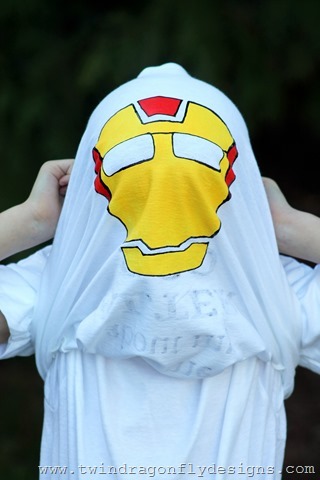 I know what I’ll be making for party favors for my sons superhero party in August. I was going to make capes but I love this so much more. It is more unique! Party T-shirts would be awesome! What an easy and inexpensive party favour! I would love to see them 🙂 Thanks for visiting! I’ve never seen anything like this … such a great and fun idea! Luke would love it. I pinned … I’ll have to make one this summer. This is awesome! I know several kids who would go wild for this. Pinned!